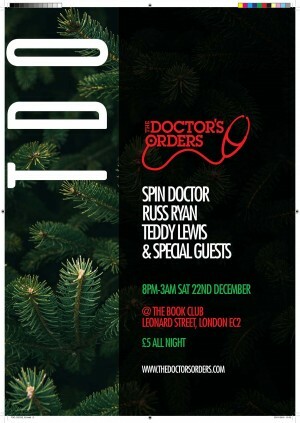 Head into Christmas week in real style as The Doctor’s Orders celebrate at this Shoreditch hotspot with Spin Doctor & Russ Ryan spinning back to back while the incredible Teddy Lewis is on warm up duty. Sure to be the hottest party in town to warm you through the cold winter month and give you something to remember as you spend a week in on lock down with your family. Expect to hear the best Hip-Hop, RnB, Soul, Disco, House and who knows what else….